Napoleon author Peggy Dymond Leavey will be reading at the Brighton Public Library on Thursday, December, 6th as part of a new monthly series called "Upstairs at the Library". She will be reading from "Treasure at Turtle Lake" and talking about books for children. 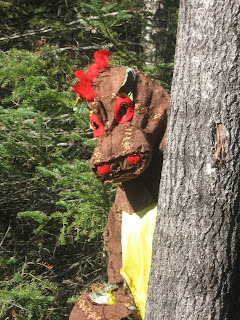 Whenever Holly Haggarty visits bookstores, libraries or schools to talk about her book, Summer Dragons, an impish dragon is often seen with her. Many readers wonder how Holly met this dragon. 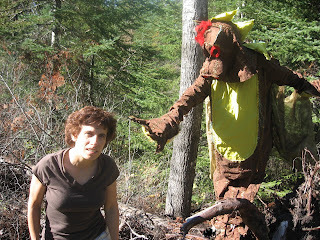 In fact, Holly met him in the boreal forest around Thunder Bay. Believing, like Beth, that dragons exist, Holly and her family had gone searching for dragons. They captured photos, which show how Holly met and befriended her dragon. On October 10th, Brenda Chapman participated in a Capital Crime Writers panel discussing the mystery market. Pictured left to right are Michael Steinberg (Storyteller Magazine), Bev Panasky (author), Linda Wiken (owner, Prime Crime), Brenda and Rick Mofina (thriller author). lian goodall will have her work on display at the Schomberg Public Library as part of King Township's celebrations for Ontario Public Library Week, Oct 15-21, 2007. lian's new book, Photographing Greatness: The Story of Karsh, will be published as part of Napleon's Stories of Canada series just after the display closes. It will be represented by showing the manuscript at various stages so that library patrons can learn about some of the publishing processes. 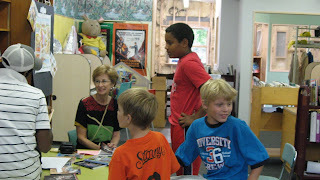 Napoleon author Peggy Dymond Leavey enjoys the company of some young fans after a summer 2007 reading at the Picton Public Library. 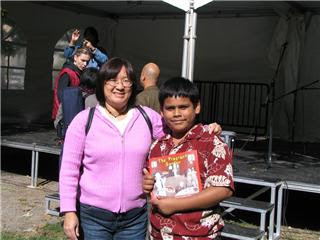 Pictured: Napoleon author Day's Lee with a young fan (the lucky winner of a copy of The Fragrant Garden) after her reading on September 29th. Holly Haggarty, author of Summer Dragons, appeared at Chapters, Thunder Bay, on Saturday September 29, along with a dragon, who roamed through the store all afternoon, beguiling young and old. Many customers successfully answered skill testing questions of dragon lore, which enabled them to search for dragon treasure. Holly enjoyed the opportunity to chat with many keen readers. lian goodall hard at work! New book! lian's newest book Photographing Greatness: The Story of Karsh in the Stories of Canada will soon be out. 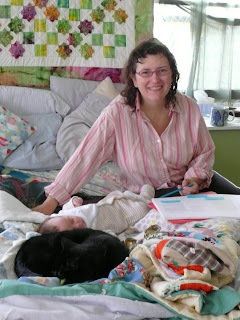 Here she is at work on the edits for the book with the assistance of her baby son, Amzie Cooke-Goodall, and Nelson the cat. It's back to class this September with Napoleon author lian goodall as teacher. Once again, goodall is leading a group of keen students taking Creative Writing/Children's Books with the York Region District School Board Continuing Education in Newmarket. We'll tickle our creativity and see what happens over the next eight weeks!